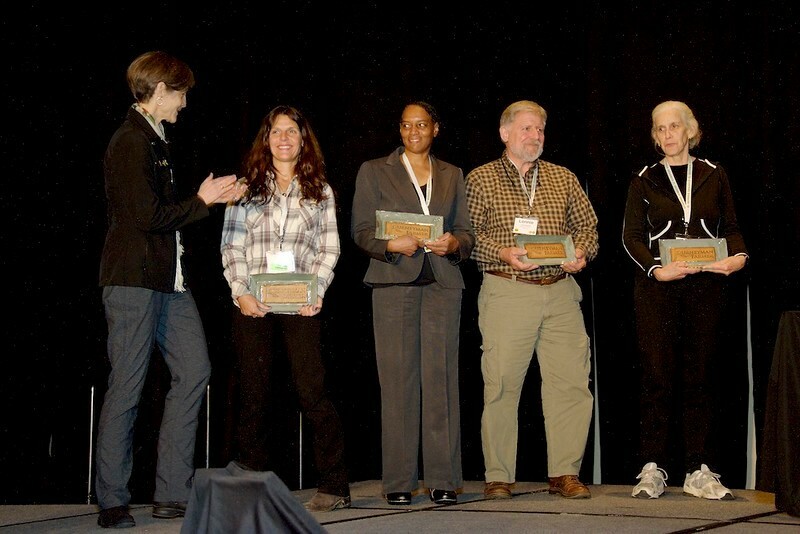 The Georgia Organics Farmer Services team capped another year of great work by honoring four graduates from last year’s Journeyman Farmer Certificate Program (JFCP) and awarding a Tiny Farm House to a farmer, both in partnership with the University of Georgia. Led by the University of Georgia Cooperative Extension, with support from partners across the state, Georgia Organics and UGA Extension provided comprehensive training for beginning farmers designed to reduce the barriers young and beginning farmers face when trying to grow new agricultural businesses from the ground up. The program aims to encourage and prepare young and beginning farmers to enter the agricultural profession and address the fact that the average farmer in the United States is close to retirement..
“Beginning farmers and ranchers are the key to preserving small-farming in the United States, and the Journeyman Farmer Certificate Program is our way of sustaining small farmer in Georgia’s agricultural sector,” said Georgia Organics Farmer Services Coordinator Tenisio Seanima. Graduates Julie Best, of Clayton; Azalea Moss, of Austell; Lonnie Edenfield, of Toccoa and Martine Olsen, of Clarkesville received business training, production training, and either an internship or mentorship depending on their circumstances. JFCP will continue in 2017, providing courses in seven counties for anyone who has been farming less than ten years continuously: Carroll, Screven, Dougherty, Metro Atlanta, Banks, Houston, and Greene. The tiny farmhouse, built by UGA undergraduate students taking a course in sustainable building, was donated by Georgia Organics to member Terri Jagger Blincoe, of Ladybug Farms in Clayton. Georgia Organics is proud to partner with UGA to offer innovative affordable housing solutions for Certified Organic farmers, farm workers, interns, and others. A Georgia Organics selection committee received several applications from farmers interested in receiving the tiny house. The farmers wrote essays explaining how they would use the house if they were to win. Blincoe stood out because she was an established farmer who had a history of hosting younger apprentice farmers, UGA Horticulture Associate Professor and Georgia Organics Board Member David Berle said. Blincoe was thrilled, tearing up when she found out she won the tiny farmhouse, which will secure hands-on support and revenue for her farm. “I will be offering 2-4 night stays to folks interested in a working farm experience – hands on growing and harvesting produce, tending to animals and eating good food,” said Blincoe. This is the second tiny farmhouse Georgia Organics has donated to a Certified Organic farmer. Green Building and the Tiny House Movement, a course offered jointly through the UGA College of Agricultural and Environmental Sciences (CAES) and College of Family and Consumer Sciences (CFCS,) launched in Fall 2015. For short, that’s called a “win-win,” just like this incredible partnership has been over the last few years.